After a nice vacation last week, I'm back at it this week...sharing some of the projects made for CHA. Up today, a 6 x 8" Burlap panel. I painted the burlap panel with Picket Fence Distress paint and set it aside to dry. Once the Burlap was dry, I drilled 2 holes through the Burlap/Masonite board for the screws in the Ruler Binding. I only used one of the ruler pieces that comes in the package (more on how I secured the screws at the end). I cut a piece of chipboard to use as a foundation. I also cut many small sizes of chipboard that were glued to the foundation piece. In other words, there are two layers of Chipboard here. One is solid and the others are glued on top, once I had the pattern. It really is like creating one of those sliding puzzles. I just kept moving the pieces and embellishments around until I saw what I wanted the final piece to be. I think one thing to keep in mind is that you can cross over the lines with larger embellishments like the Ornate plate. It really touches 4 different squares. That Ornate Plate also helped the Enameled Tag in the top right corner (wish) not look lost on the larger rectangle piece. It takes in just enough of the corner to make it work. Once I had an idea of what I wanted, I added paper to the chipboard pieces, then sanded and inked the edges of each piece before gluing to the foundation. I used the paper from the back of the Merriment Paper Stash (2 x 2" squares + ATC sized) to cover the small pieces of chipboard. The scale of these papers were perfect. The Ornate Plate was painted with Distress Paint and dried with the Heatit tool (don't forget the brads). The calendar is really a little door. The Game Spinner turns so the door can open up. To make the chipboard piece a door, I just cut the polka dot paper longer and glued it to the foundation piece. Once dry, I added the picture of Santa over the top to cover it up. Easy to do... just takes a little thought. The rectangle with all the Remnant Words is a cut piece of Mirrored. Cut the piece, peel off the protective plastic coating then lay Remnant Rubs over the top and rub them on in one big chunk. Just remember to take off the plastic coating first...I mention that just because I might have forgotten that step (once or twice). Love the new Mirrored Stars and Industrial borders! Once my foundation was complete, I slipped it under the Ruler Binding (I did add glue to the back). I adjusted the screws so the ruler was tight against the foundation piece...pulling them from the underside. Then added Glossy Accents all around the base of each screw. I am sure any thick glue would work for this step. Now just let it alone to dry completely. I have a few things to give away this week including a couple messenger bags signed by Tim (they have stuff inside too). Leave me a comment on any of the posts coming up this week and your name will go into a drawing on Saturday the 10th (yes, you can comment on each post for more chances to win). Love this project -your attention to every little detail is amazing. The door is a great idea! I. Love. This. Using the remnant rubs on the Mirrored just blows me away!! Love this, the ruler binder is perfect, will have to try this. I can't wait to get my hands on this stuff. I'm haunting my local store almost daily! Fantastic festive piece! Your attention to detail makes it. Good idea to use the spinner to keep the door closed. Thanks for sharing how you made this - love it! Love your panel - unique and charming! Very cool! I just might have to make one of my own! I love this panel and now have visions of one for every holiday-especially Halloween. Thanks for sharing and the chance to win! Tracy P.
I've not had the opportunity to play with these burlap panels but I love how much you have on this and it doesn't look busy. I look forward to more posts this week which means more chances to win a bag filled with TH goodies! Thank you for your inspiration and sharing! The panel is wonderful. I have not had an opportunity to use one of them YET!! And here it is. I love it. I can hardly wait for the goodies to arrive. I'm hooked and haven't even started. Oh Bon! Just gorgeous! And I love how you've made that little door. What a beautiful piece. Can't wait to see all the new goodies in stores. This is really beautiful and festive! I am drooling over Tim's new Christmas paper - can't wait until it's available! And the industrial trim is really nice! I love this project, especially the little door that opens. The paper stash....can't wait! Oh my gosh - I love, love, love this! The products are wonderful too! Your Christmas Burlap Panel would make a wonderful gift! I like the door that opens and the clock hand that keeps it closed! Christmas is such a special time of year and your gorgeous project captures all that I hold dear about it -- the wonder, the belief, the magic and the peace. You nailed it with this one and I think I would have to display it all year round. look forward to playing with all the new stuff coming out! I loved it when I saw it in a CHA video and even more with the close-up pictures and explanation of how it was made. Thanks so much for sharing. Just delightful! I like your idea of using the game spinner to hold the calendar door shut! I definitely need more stuff to add to my craftroom LOL! Love the little door with the vintage Santa picture behind it! It gives me the idea to do something like that with my Christmas cards. All I can say is... WOWSERS! This is so cool! I LOVE the ruler binding and the remnant words mirror piece. So creative! Love this ! The paper, the design. Love it ! Love your project. The paper is just gorgeous. Thank you for sharing and a chance to win. Loving this! Those stars are too darn cute!! I love it!! My favorite part is the little door that opens! So many cool details! Gorgeous!! My favorite part is the mirrored piece with remnant rubs. Thank you for the inspiration! Forget summer...let it be Christmas!!! What a great piece of art, so many lovely details to detect! Love every bit of it! Gorgeous project and so great that you would share this. I love the hidden door and... my gosh I love it all. I am so inspired by your creations. What a beautiful way to us a burlap panel. Love all the little details in the Christmas piece. I love it! Christmas is my favorite season; well I also love Halloween!!!! It's awesome! Very modern yet retro at the same time. Thanks for sharing. I was hoping to see this in detail....it is wonderful. I would be delighted to win ... anything Tim is the best ever. Your work is such an inspiration to me - thank you for sharing it with us. Love the panel. Nice and Christmasy. What a great piece of art. Burlap is so in right now. Merrry. merry , merry! Love the panel! 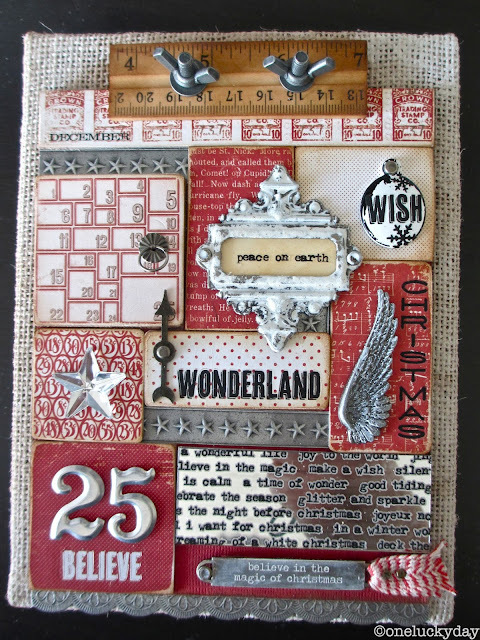 I saw this in one of the many videos I watched of Tim Holtz. It's adorable! I will definitely be making it. Thanks for sharing. Could this be the Christmas Kit this year??? Love it! I love it. I may have to get me all the items and make myself one. Paula you are a busy woman and I love all that you are doing with Tim's stuff now. Love how all this fits together! I just love the mirrored stars and industrious borders, can't wait to get those. Did you do something to the wing? or is that the way it came? Looks all distressed somehow and is just perfect for this. Absolutely exquisite!! I love all the detail that you put your project. It really is Magically!! Love this panel. I really like how the rub-ons look with the mirror. Very festive piece! Love this piece - Paula - you make it all look so fantastic. A bag signed by Tim with goodies would be a delight to win. I love this piece. 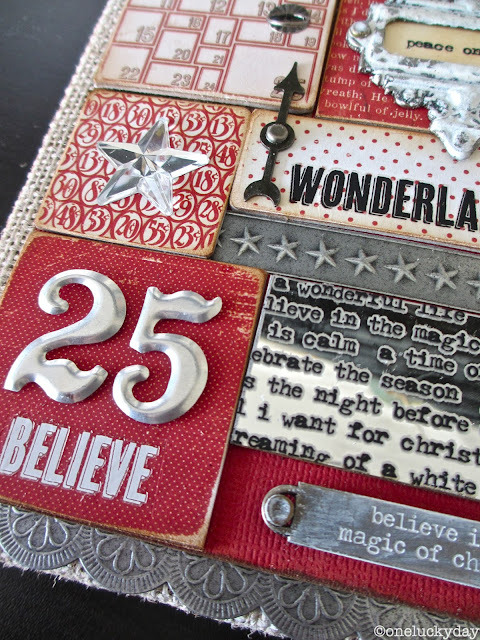 It gives me ideas for Christmas cards this year. .
WOW...another great project...I LOVE your blog....this reminds me of a smaller version of your advent calendar....off to order some burlap panels!!!! thanks for a chance to win...anything!!!! i love this! thanks to you i now have an idea for christmas presents. love your panel and as usual i am in awe of your creativity. As always, your projects are Amazing. I love the door that opens and the spinner to keep it shut - so creative. Your piece is absolutely amazing! Gorgeous piece! The little door is an added treat. Can't wait for the new stuff to hit my local stores. I love all the beautiful details of this! This is just beautiful. I love that mirrored paper - gonna have to be on the lookout. Always love your amazing projects!!! Can't wait to play with all the new products. Thanks for all the inspiration!! What a great project! Love the calendar door, and the Remnant Rubs on the piece of Mirrored. So AWESOME!!!! Teach me to make it!!!!! I just adore this canvas! It's wonderful! This is a fabulous piece! I love how the calendar opens. You are so inspiring - thank you! Lovely as ever. I too just did a project with Mirrored plastic and left the dang plastic liner on it. It is embarrassing isn't? LIke I looked around to make sure nobody saw me do such a stupid thing-even though I was home alone. I can't wait to get my hands on the stars and the trims...oh and the paper....THE PAPERS. Gorgeous as always. You are always an inspiration. Thanks. Love how you attached the rule. I just got a vintage ruler at a yard sale. Thanks for another idea how to use it! 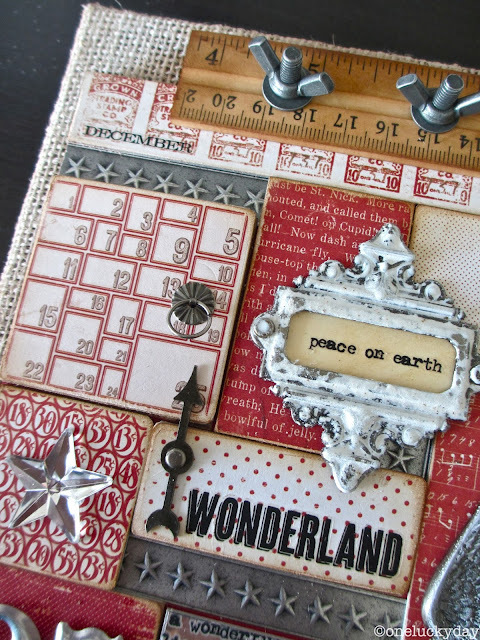 I am really taken by the Merriment paper and your project is a lovely example of the paper at its best. I have pinned it for inspiration for an advent calendar I plan to make this year with Tim's new paper stash. I'm anxious to get some and glad to hear it will be available soon. Love all the different textures on this project--I thinks it's time to work on a fall themed project--thanks for the inspiration! I absolutely love this project. I can't wait to try a similar project myself. The hidden picture was quite creative, as are you! Thanks for always sharing. I love looking at all the different elements on this piece..
LOVE it !! I may try a Hallowe'en one too. Such a nice project !! I love your burlap canvas. It would make a great Christmas gift! Can I live in your head for just one day? LOL! I just love everything you design, I'm a big fan! Love this! I will be making one as soon as the product arrives! Thanks for sharing your awesomeness!! Oh this is so cool - I just love it! Thanks so much for sharing this wonderful project!!! I love the collage look of this project! This is simply beautiful! I love the eclectic nature of it and of course the vintage style is right up my alley! Great alternative use for the ruler binder too!! So very clever, as usual!! This is really so COOL. I am totally in love with the paper and you have used it to just great advantage....Your pieces are so fun!! I finally know what to do with the ruler! LOL. And stamping on the mirror??? Just so COOL. Oh yeah, I already said that. But still - it's true. Thanks for sharing.!! This is so beautiful!! Love it so much!! So cool... and there was me thinking the red+white papers were one of the releases I could live without... maybe not! Love this grid, and the opening flap is brilliant. Love it- I am so loving using burlap in my projects lately and so glad there are now burlap panels to buy instead of doing it myself. I get glue and little fringes of burlap everywhere !!-lol. Thanks for sharing and the chance to win. This is so going on the top of my "TO DO" Christmas list this year!!! Love it! What a great project! I may have to try this one. What a great way to use all the goodies coming out too! I love this project. I am ready to start creating for Christmas. You have inspired me! Wow what a great project thanks for sharing! and you get to see more. This is gorgeous! So many great details, I love the little door! 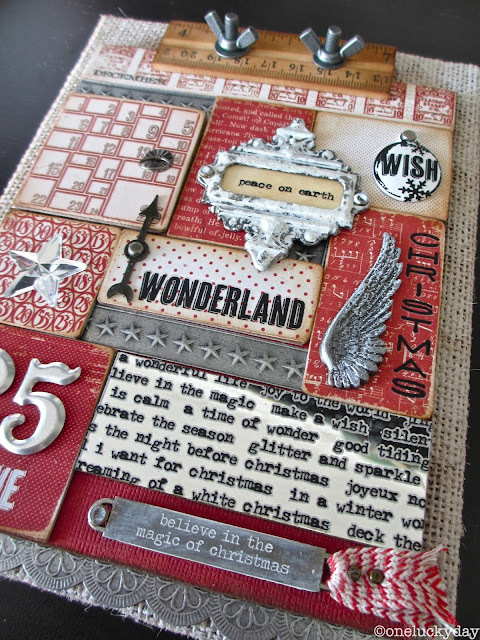 Gorgeous project and great inspiration to get going with Christmas crafts now ... December is just too late!! Paula: Until I saw your work here, I would never had considered buying the burlap panel But, I am amazed at what you did with it and also the paper. The lift up surprise element made me squeal. Yes, squeal like a kid. Love LOVE..LOVE it all! Thank you for you. Loving this piece, especially the door that opens. Those little mirrored stars are AWESOME! What a fun project! I love this Christmas panel, and it looks very doable!! Thanks for all the detailed instructions you share! Wow, what a great Christmas decoration. I love it. I am so amazed at how your mind works to have come up with this gorgeous project! I read through the post and was fascinated by how you created it, and all the little surprises along the way. Thank you for sharing it with us! 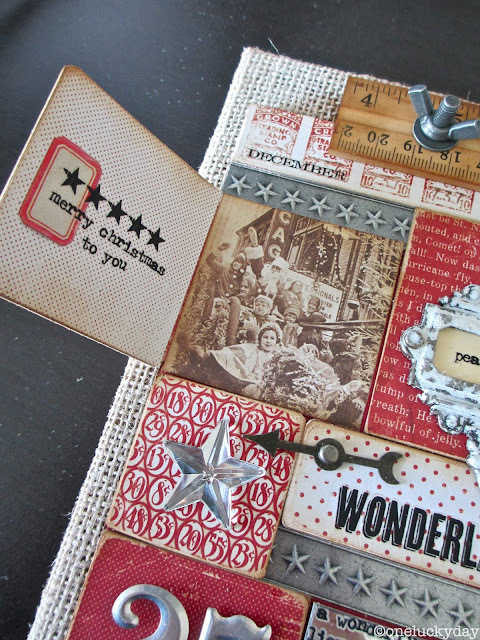 Your vintage christmas cards reminds me of those growing up but with a fresher feel to it. The burlap collage is wonderfully constructed, the red and black theme looks great.